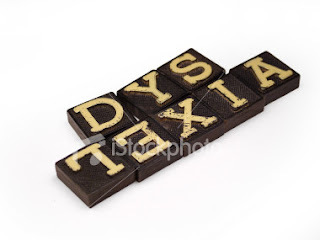 Dyslexia is more than spelling words backwards and rearrangement of numbers and letters. It is more of an auditory disability where people who suffer, especially students, tend to have difficulty remembering what they read or heard. They seem to have difficulty in performing tasks given with rapid instructions because they need extra attention in learning step my step rather than all at once. People with dyslexia often have to learn on aspect at a time rather than trying to grasp the whole concept at once. These people are often more depressed and experience low self esteem because the school years of their lives are more challenging that the average student. They are usually at a lower level in reading and comprehension and seem to be less coordinated than other students. This tends to lead to dyslexic children to not participate in organized sports. When students are diagnosed with Dyslexia, this is where the school district has to implement a Special Education environment to help these students. There are many standardized tests to help determine the area(s) of weakness of these students to be addressed, but there is no real cure other than knowing where and how to help the student gain the knowledge needed to fulfill the requirements as a student. So fi uyo find yourslfe rearrangning letters adn words once in a blue moon, its doesn't necessarily point yuo in the direction of Dyslexia. It may just be pointing you towards a nap becuase your probably a little tired.